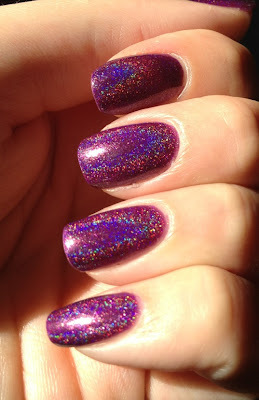 As I posted on my Facebook page, I had some awful nail breaks so I haven't wanted to take pictures of my nails. 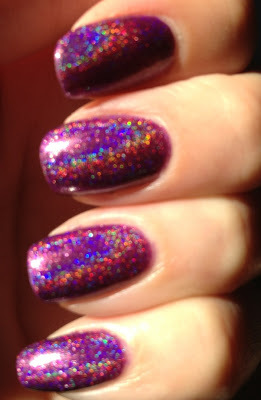 I do have tons of manis from when I wasn't so good at taking pictures. Would those interest you? Let me know! 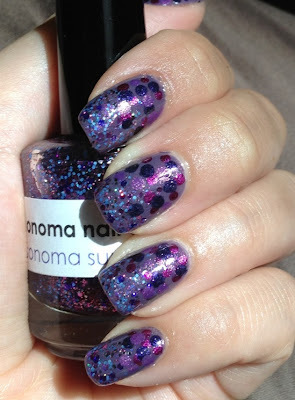 Here is a simple palette cleanser I did after tons of nail art. 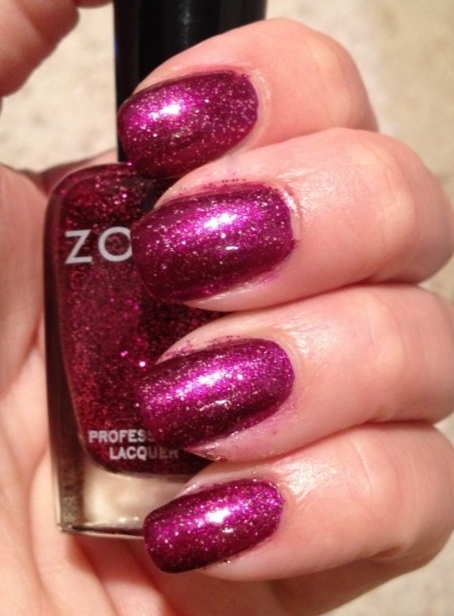 Ozotic 513, now discontinued, was a gift from the boy. 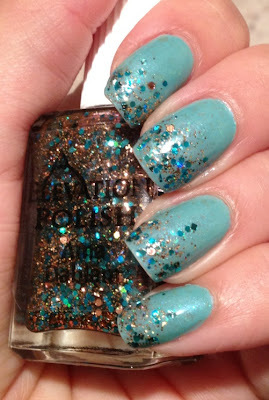 Holy crap this is one blinding polish. Two effortless coats. Perfect formula. No clean up needed. Gorgeous in low light. Blinding in sunlight. Enjoy. In shade. It's still gorgeous. 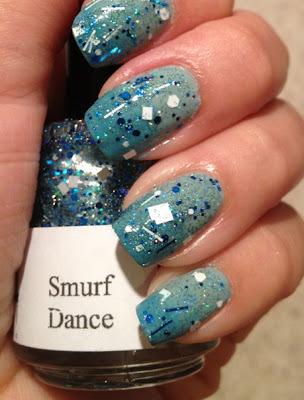 I jumped at the opportunity to purchase Girly Bits Smurf Dance. First, I had no Girly Bits (what is wrong with me?). 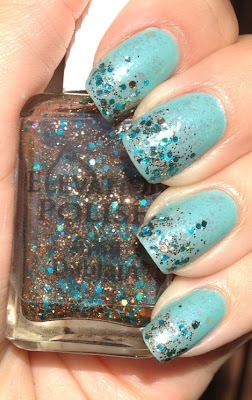 Second, I loved it when I saw it on The Silverinator's blog but did not win her giveaway. Third, I apparently don't own enough blue glitters. I got it in the mail Tuesday and have it on now. I love it! I stumbled upon Sag Harbor in a dusty and paid a whole $5 for it. 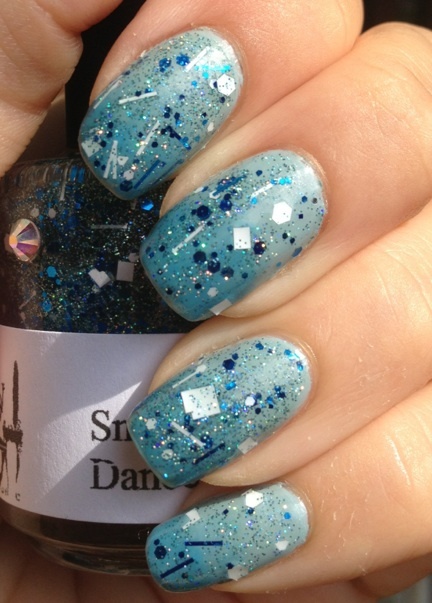 This is a pale shimmery blue. It's a good amount of shimmer so that it is not frosty. Two coats and I was done. 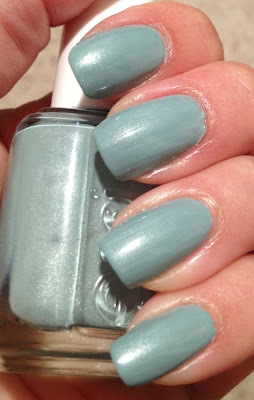 Then I used Essie Shelter Island (see my original post on it here). Shelter Island has a somewhat jelly finish so I knew it would be sheer. You will see it is not a smooth gradient and there is a reason for that. After that dried, I put on just one coat of Girly Bits Smurf Dance which smoothed out the gradient. Application was a breeze. The formula was thin but allowed the glitter to spread out easier. The only thing is that I wish there were more large squares. I *really* had to shake it upside down and dig for that one square. Totally worth it. Loved it. Unfortunately, the Essies are now pretty hard to find, but if you do, buy them immediately! 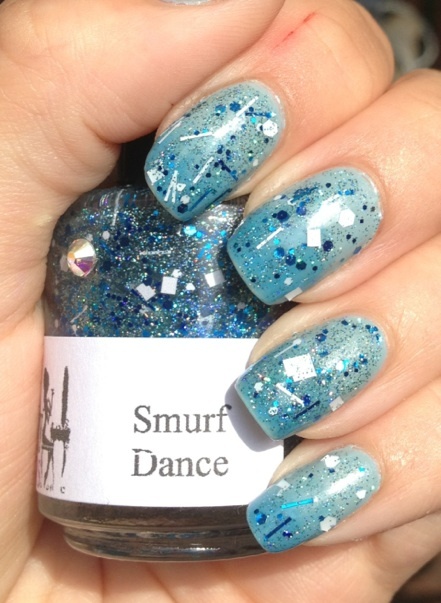 Pam from Girly Bits may release Smurf Dance in the future. 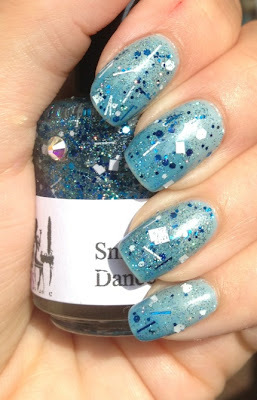 If you love the color, let me know in the comments so I can pass them along to her! 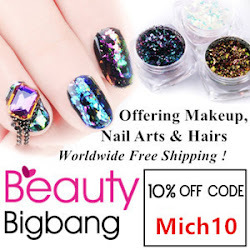 Meanwhile, she has tons of other gorgeous polishes that you can purchase here. Last, I finally have chains for my pendants so take a look at my Etsy store and Facebook page for more updates! Where to start with this polish...sigh. Ever since I saw steffels. 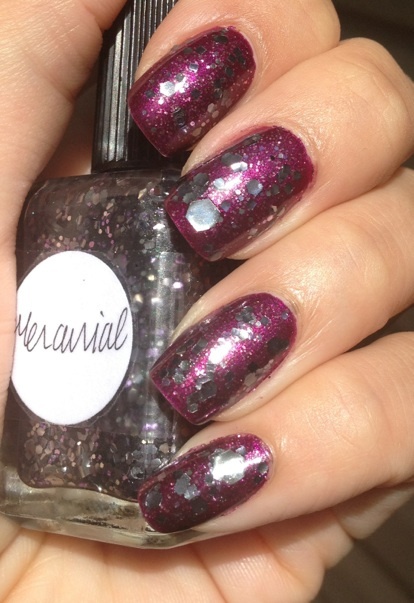 pictures of Mercurial way back when, I wanted it so badly. 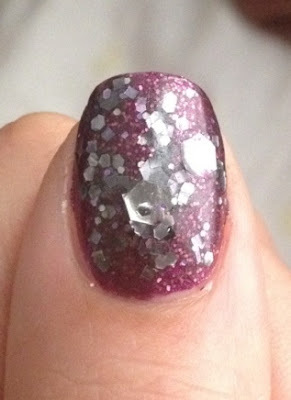 Those giant hexes made me swoon and the gunmetal color just caught my interest. When I had the chance to buy it at retail, I jumped at the chance. 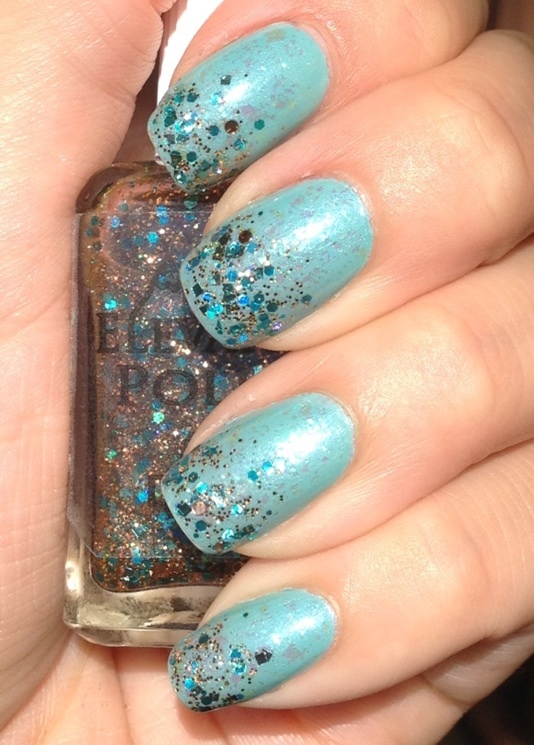 Bought it, put it with my other polishes and of course, it drowned in a sea of untrieds. 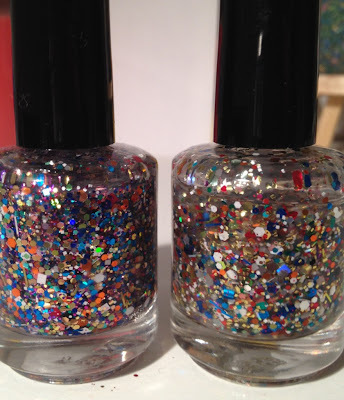 Then, some other indies came out, there were reports of taco glitter, which is when hexes curl so badly that they resemble a taco shell. At the time (March), I didn't have that many indies, so I decided to check them all. Oh my sadness when I could clearly see my Mercurial completely taco'ed in the bottle (not reflective curling), then I swatch it on a nail wheel and my heart dropped. The hexes were completely unwearable. 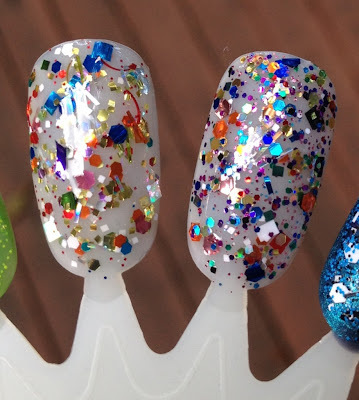 $15 for a homemade polish is a lot for me (we won't even talk about $700!) and when I saw this, I was disheartened. 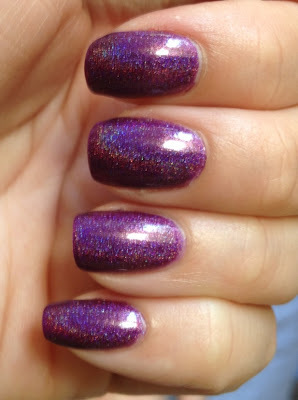 I was granted a refund because the whole reason I wanted this polish were for the hexes. Take today. To celebrate a special day with the boy, I decided to match my dress. 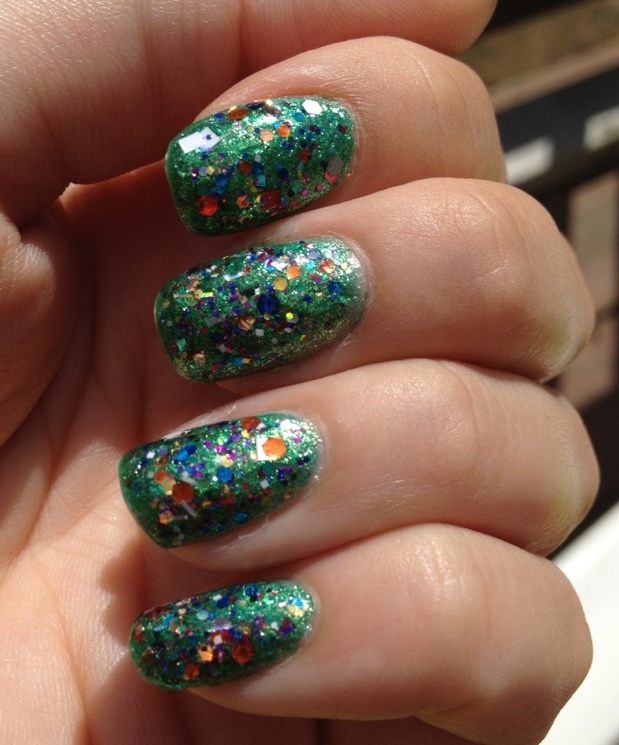 I started with one coat of Zoya Carly, which positively glows. I thought I didn't want this one, but picked it up during the Earth Day promo. 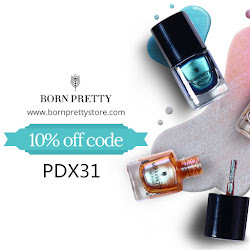 One coat is all you need! It's amazing. 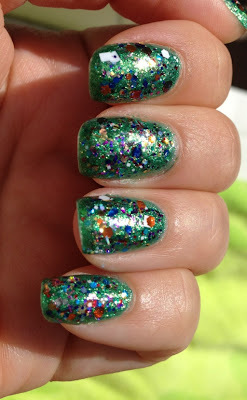 I then used another Earth Day purchase, Zoya Nova, which completed my Zoya Ultra Glitters collection. I used one coat to make Carly sparkle. Nova has a tinted base, but it was sheer enough to not alter Carly's color. 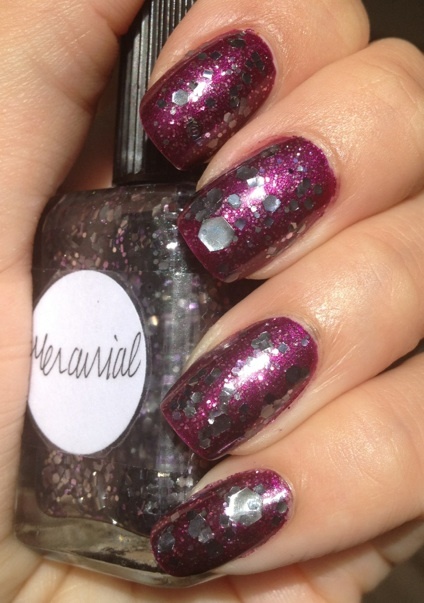 Mercurial is a mostly gunmetal glitter in various shapes in a lightly tinted grey base. 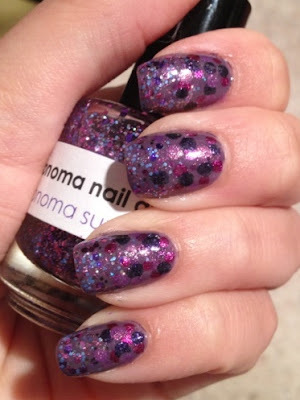 It also has some black and lavender glitter, but they are sparse. 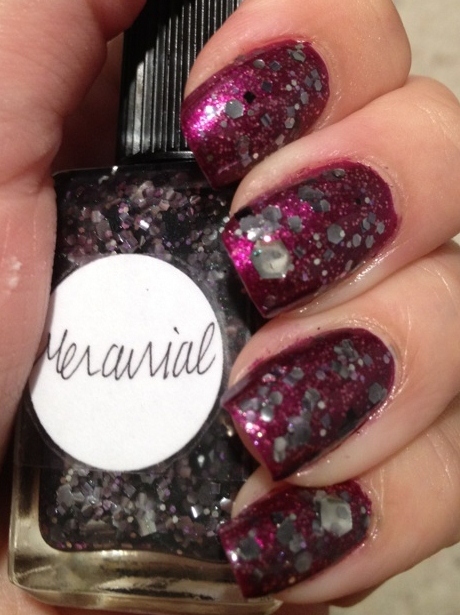 I attempted to swipe on one coat of Mercurial but that was impossible. When I swiped, the glitter just stuck in clumps and would not spread out evenly (ie: my thumb). Also, I managed to get out six large hexes without digging, but only one was completely flat :-/ When I saw a hex was coming out, if it was curled (literally some "hug" the brush, that's how curled they are), I put them on my curlier nails, like my pinky and ring finger. Next time, I plan to thin it out with some thinner and possibly avoid the large hexes all together. Some nails needed FOUR+ coats of top coat (pesky thumb). 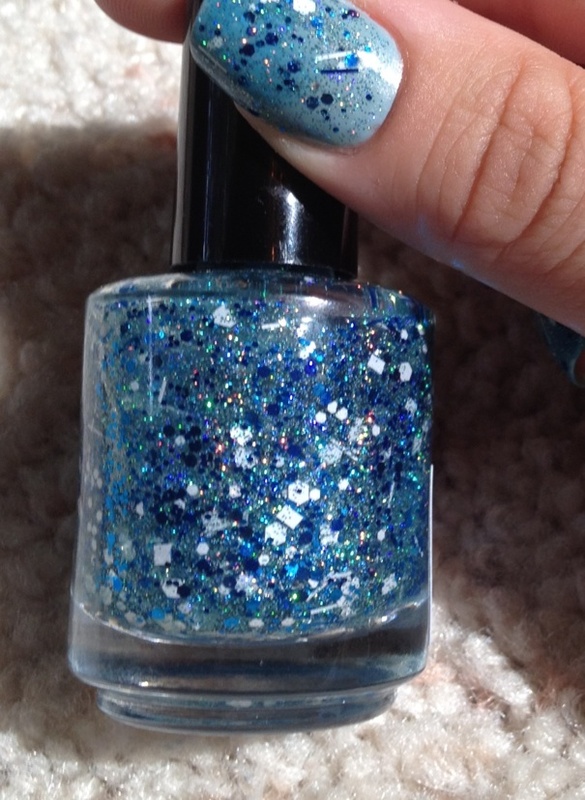 My apologies for the Zoya Carly and Nova pictures. 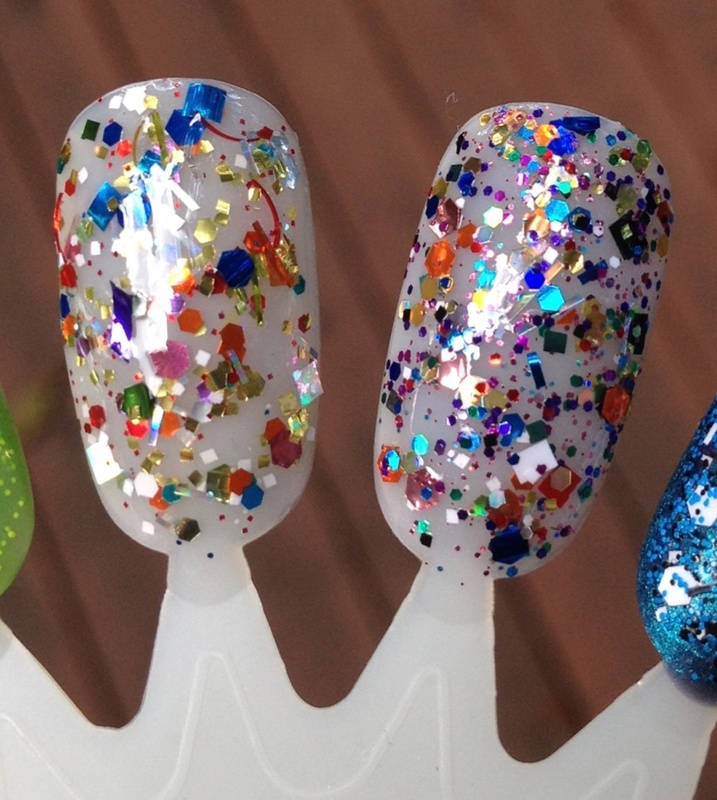 I always do my nails at night and I really need to make a light box! I love these giant hexes; they make the polish for me. 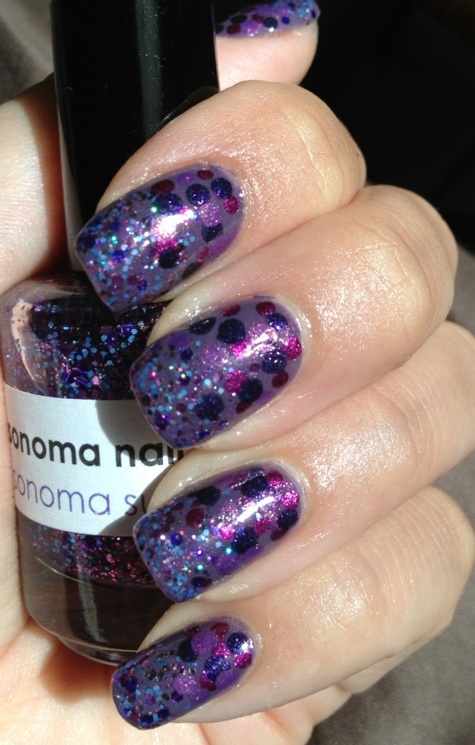 See what I mean about clumping? This stuff stuck the minute I put the brush down. All in all, it took my way too long to maneuver these hexes but I do think the end result was beautiful. What do you think? I have been working my way through my untrieds lately. I went on a no buy in July, but broke it for the A England sale. I'd say 5 polishes in a month is not bad. 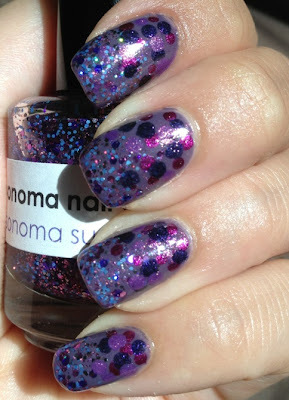 But in September, I'll be back to my no buy because once those Halloween polishes come out, I will probably go crazy. 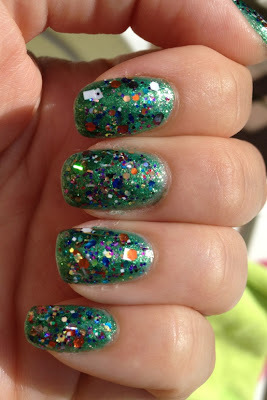 Then I decided to use KB Shimmer Clown Puke. This is my second bottle since my first had curly red bars and it was so annoying I knew I wouldn't use it again. This version is much better but also much prettier. My first bottle was heavy on yellow/gold tones and this one was more rainbow (comp pic below). 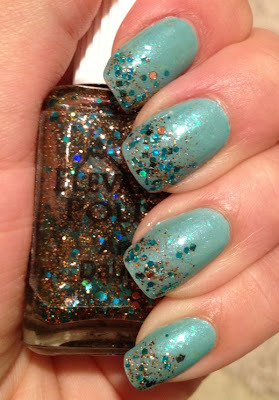 I guess this is a kind of "everything but the kitchen sink" polish, but I didn't realize they would be so different. I do like this polish but I think the white glitter actually kind of ruins it. 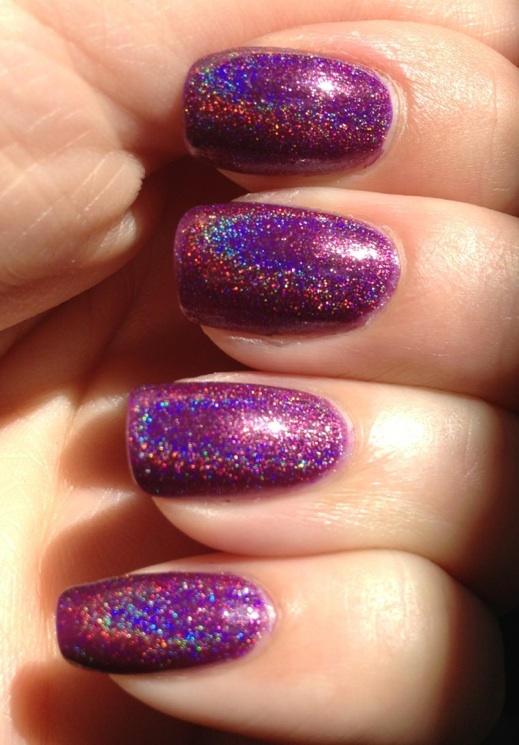 But the black glitter really adds depth to the shiny rainbow goodness. 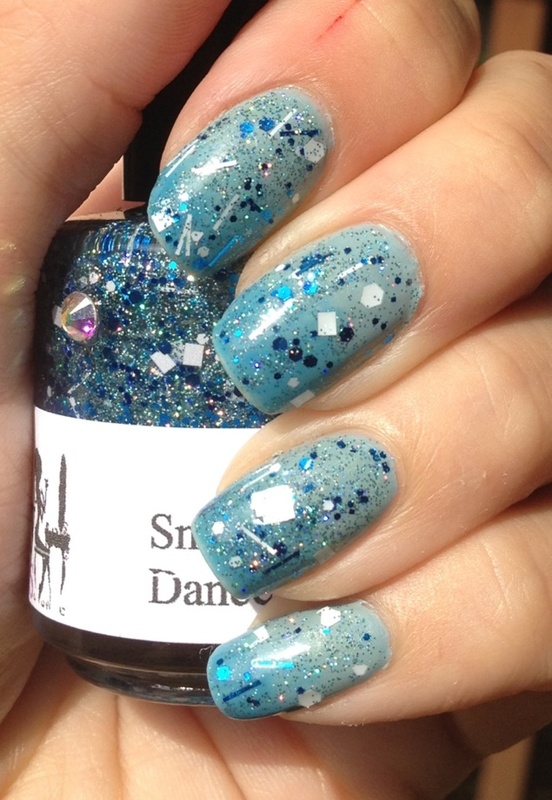 Unfortunately, I only had SV with me and it caused shrinkage on the Zoya and chipped like the next day. Sad. 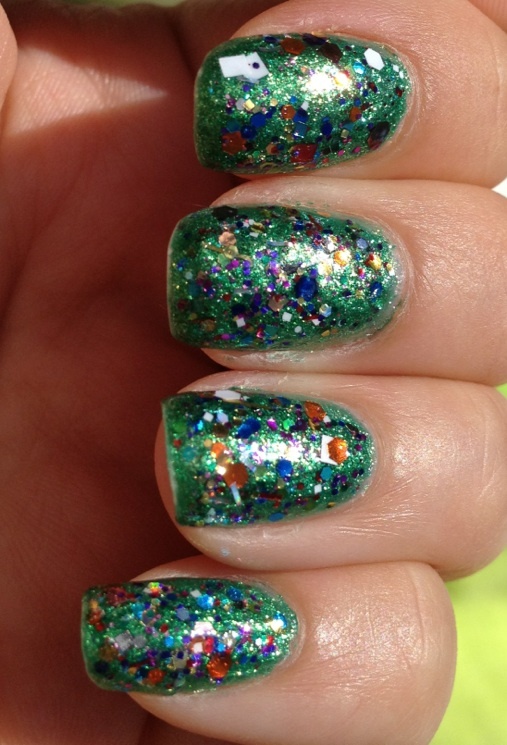 Some manis are just not meant to be. The manicure was actually beautiful and blinding, just did not last long. Yes, that is a dog under my hand. New on left, old on right. Do you see what I mean? So what do you think of Clown Puke? I thought I would love it so much more. Next time, I think I will try to avoid getting white glitter on the nail. Have you visited my Etsy shop or liked my Facebook page? 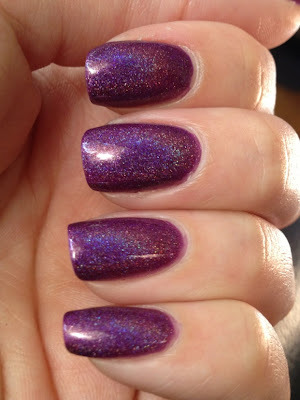 As part of my effort to go through my untrieds, I chose Essence I Like as my base color. 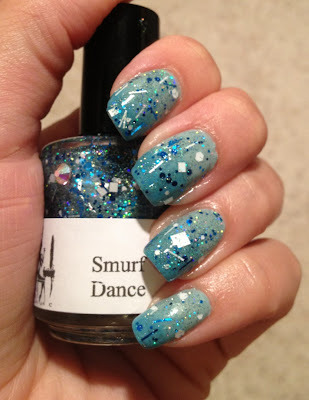 I used two coats of this gorgeous shimmery light blue, which went on perfectly. 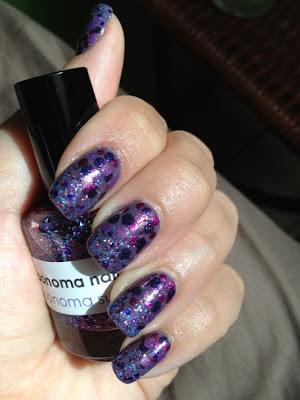 If I recall, this was from an LE collection that I randomly found on clearance at Ulta. 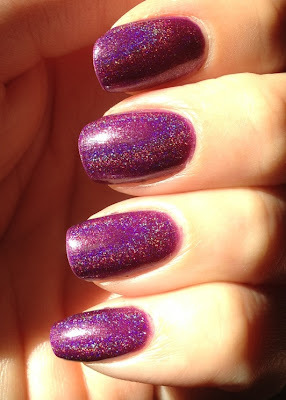 Then I used one coat of Zoya Maisie, which is one of the Fleck top coats that came out last year. Lastly I dabbed on Ama Dablam. What makes Ama Dablam so unique is the combination of glitters. There are teal hexes and squares with copper microglitter and CIRCLES (and probably other glitters I am missing). It looks like tiny pennies on my nails. 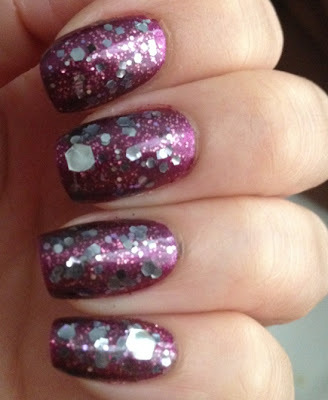 I love that the glitter is all mostly the same size too. 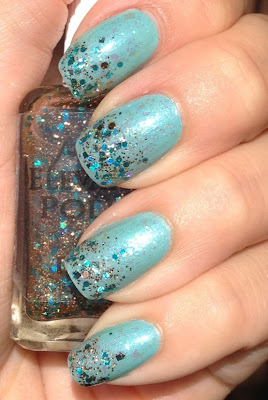 Too many glitter polishes have a cluster of random sized and shaped glitter that look too messy and I really love that this is a nice, consistent glitter. Trust me, you want to enlarge these pictures. I can't say enough about this polish. If you would like to pre-order one, TODAY is your last chance. Check out this link for more information about the Ama Dablam pre-order. Don't forget to like my Facebook page and visit my Etsy shop! I absolutely adore these blogger collaboration days! I was away and almost totally missed this one! 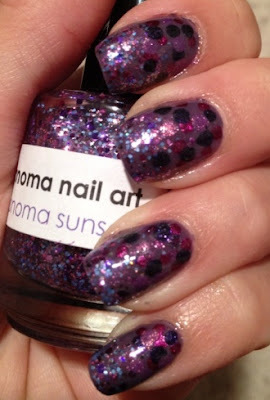 I unfortunately was completely SET on using Sonoma Nail Art Sonoma Sunset, which my amazing polish friend Tina sent me knowing how much I had wanted it. I did a gradient of Sonoma Sunset over two coats of Zoya Lotus. This combo is PERFECTION. Because I knew I wanted to do that mani, I decided, hey, let's gradient dots from the bottom up. Two gradients going two directions?? Hmmm, not so much. But here it is! 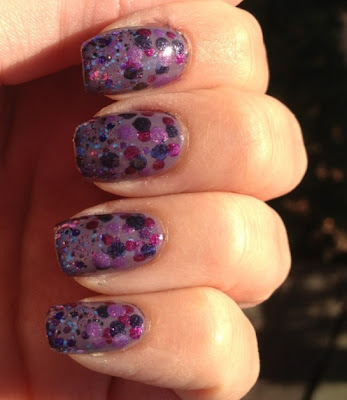 For the dots, I used Zoya Carly (magenta), Dannii (lighter purple), and Julieanne (darker purple) to bring out the colors of the glitter in Sonoma Sunset. 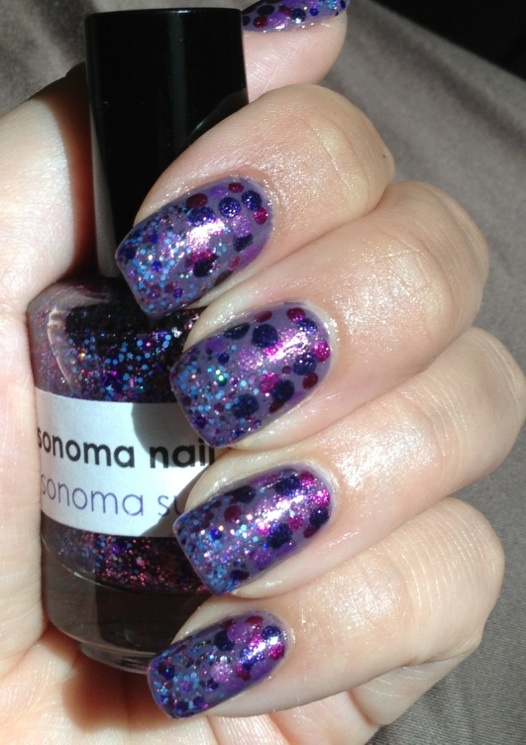 Sonoma Sunset is a complex combination of purple glitters, which includes amazing periwinkle glitters. There are some medium hexes too, mimicking the microglitter. 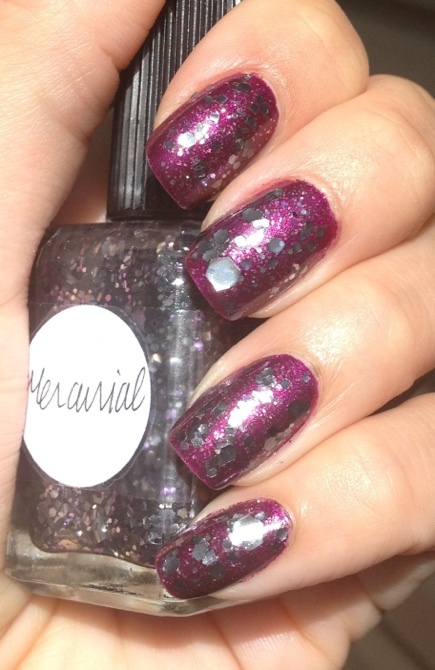 The balance of the medium hex to smaller glitter is absolutely perfect. Basically, I love this glitter. I had Tallulah on my toes and just put 20,000 Leagues on my toes, and I must admit, I'm thinking Sonoma Nail Art is becoming one of my favorite indies, along with NailVentourous Lacquers. Please check out my friends' dotticures too! Some were so creative, I cannot even handle it. I wish I had more time (though, in total, this took about 30 minutes, not too shabby). Do you think my gradients from both ways failed? Lastly, please take some time to like my Facebook page and help me get to 100 likes! ALSO, I now offer chains with my necklaces! Please check out my Etsy page for newly added pieces! 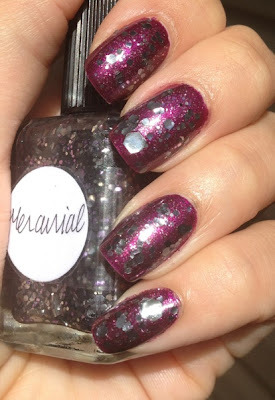 Although I'm not obsessed with the popular indies that are creamy white bases with rainbow glitter, I have to admit that when I saw Granite by Nailventurous Lacquers, I *needed* it. 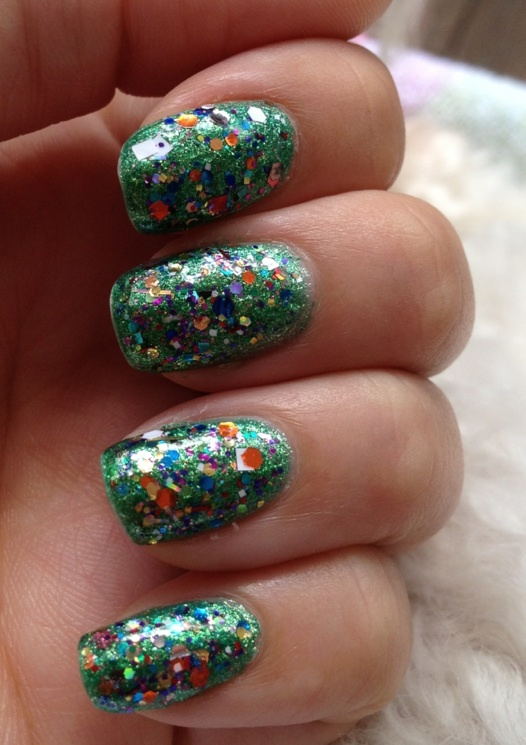 This is such a simple glitter, yet the color combo makes it so complex. 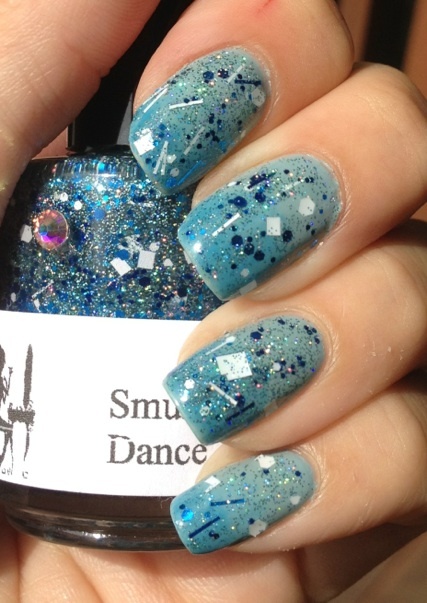 Granite is in a white creamy base with black microglitter and copper hexes. It is SO beautiful and delicate. My mom hates white polish but loved this. 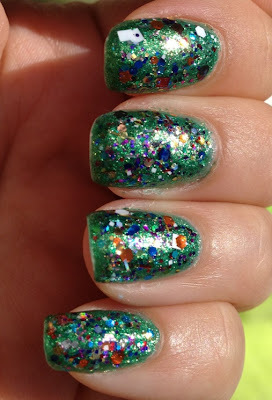 I added one coat of NVL Granite over one coat of Wet N Wild French White. Granite can definitely become opaque on its own, but I know I'll probably never get another bottle of this and I love it SO much! Faraway shot. I love how Granite makes me look tan. I guess Black Shredded is slightly tinted, so this just looked awful over the white base of Granite. 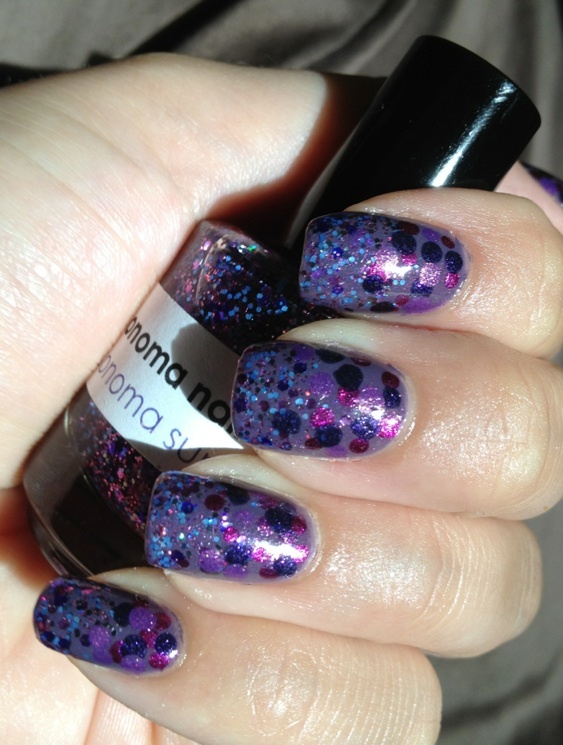 I can't wait to wear it over neons though! Have you liked and visited my Facebook page yet? ?